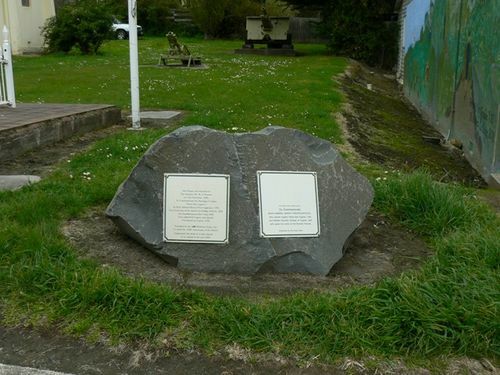 Plaques commemorate the naming of the town by D`Entrecasteaux and the pioneering of the district by William Nichols and the establishment of the town on the 150th anniversary of the district. A time capsule is underneath the stone and is to be opened in 2034. To Commemorate Rear Admiral Bruny D' Entrecasteaux who named Cygnet 'Port de Cygnes 1792, and William Nichols, pioneer of Cygnet , 1834 who gave his name to the Nichols Rivulet. This plaque was Unveiled by The Warden, Mr. M.J. Thomas, on the 11th November 1984 . To Commemorate the Naming of Cygnet "Porte de Cygnes" , by Rear Admiral Bruny D'Entrecasteaux , 1793. The Pioneering of the district by William Nichols, 1834. The Establishment of the Town, 1838. First called Port Cygnet , then Lovett. Proclaimed as Cygnet , 1915. Presented by the ANZ Banking Group Ltd., To Mark the 150th Anniversary of the district. Underneath this stone is a time capsule to be opened in the year 2034.